Most mobile phones and a lot of modern computers now have high resolution (Retina) screens, this means they have a higher pixel density. If you want to make the images from your site look really sharp on both standard and high resolution screens, you will need to provide addition versions of your image files with different pixel densities. If you are not from a design background, this may sound a little confusing. Basically an @2x image is twice the size in pixels as an @1x image and an @3x image is three times the size of an @1x image, e.g. 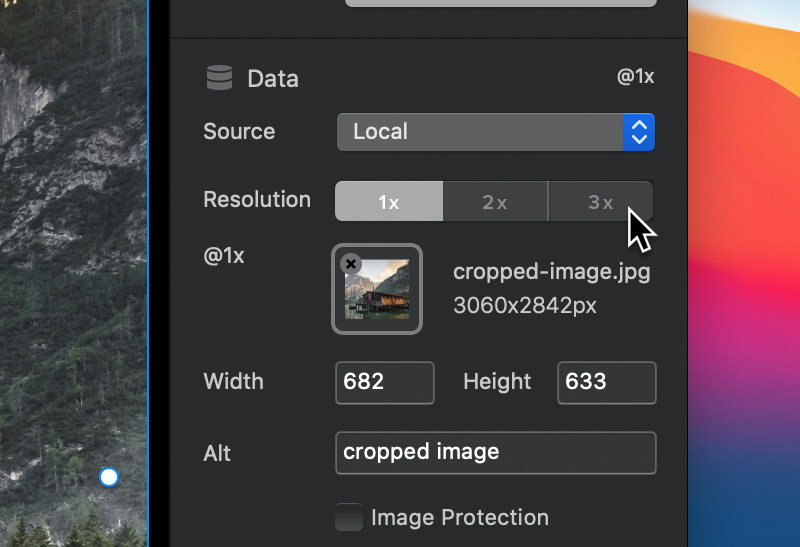 When creating multi resolution images, it’s common to apply a text suffix in the file name for the higher resolutions, so they can be easily identified e.g. 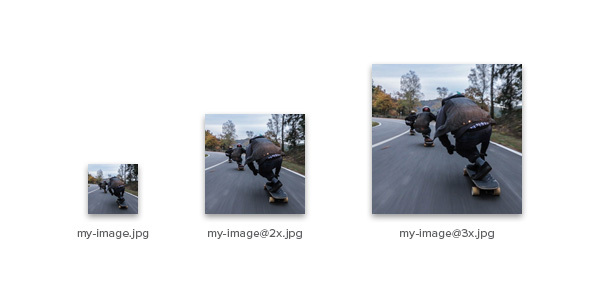 Once you have your images created in the 3 required sizes, Blocs makes it very simple to add them to a project in order to deploy the correct size based on the users screen density. To add multiple resolutions for an image Bric, simply select the Image on the design canvas by Left Clicking it and then navigate to the sidebar inspector options. Under the section labelled Data, there is a 3 way segmented control with each option labelled @1x, @2x and @3x. Left Clicking any of the 3 options will set the image options for that target resolution. Now if you Left Click the image thumbnail located directly below the segmented control, you will be asked to select the specific image file to be shown in that resolution. You can now apply additional images for both @2x and @3x, these additional images will be served to a visitor if they have a device with a higher pixel density. If you are running Blocs on a high resolution screen you may notice images may appear blurry. This is due to the fact within the design environment Blocs displays the none retina version of an image on the design canvas. When you enter preview mode or export your site, you should notice the high res variation of the image is now displayed correctly.